A brisk, vibrant fragrance...energetic, masculine and appealing. The sleek, architectural lines of the glass bottle capture the sophisticated essence of the fragrance inside. I had sampled a line of Dior products using my colleagues at work for opinions. 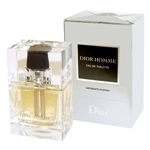 Dior Homme won out as the easiest for me to use without overpowering the office.